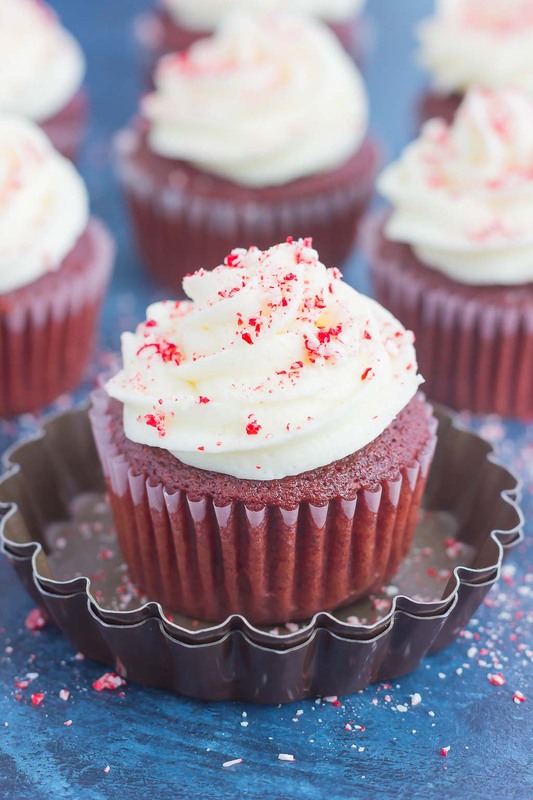 These Peppermint Red Velvet Cupcakes are light, fluffy, and bursting with sweet chocolate and hint of peppermint. 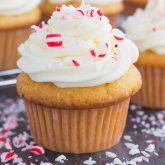 Simple to make and topped with a swirl of peppermint frosting, these festive cupcakes will be the hit of the holiday season! Well, maybe not in terms of snow, but with the explosion of holiday decorations, crowded stores, and endless seasonal commercials and movies, I think we can safely say that Christmas is just around the corner. And speaking of commercials…I saw my first Christmas commercial back in the beginning of October. How crazy is that?! I’m all for holiday spirit, but that was way too early. Did you shop the Black Friday sales? Or are you shopping today for Cyber Monday? I’d love to know what deals you find! I say this every year, but I’m really trying to embrace every day of the holiday season because it always goes by in a flash. Before you know it, January will be here with nothing in site but cold, snow, and more snow. Can you tell that I hate winter around here? So to kick of the holiday season with a bang, I thought I would share my new favorite cupcake. And if you know me, I’m not a big fan of cakes and cupcakes, so this is saying a lot! It’s also filled with my favorite holiday flavor, peppermint! 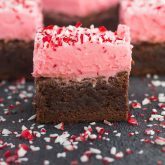 Did you know that peppermint and red velvet go well together? So well, friends! Dare I say this is my favorite cupcake to date? But, I can’t take all of the credit for this recipe, though. I found this cupcake in an older issue of the Food Network Magazine from three years ago. I saved this recipe and am finally putting it to use! 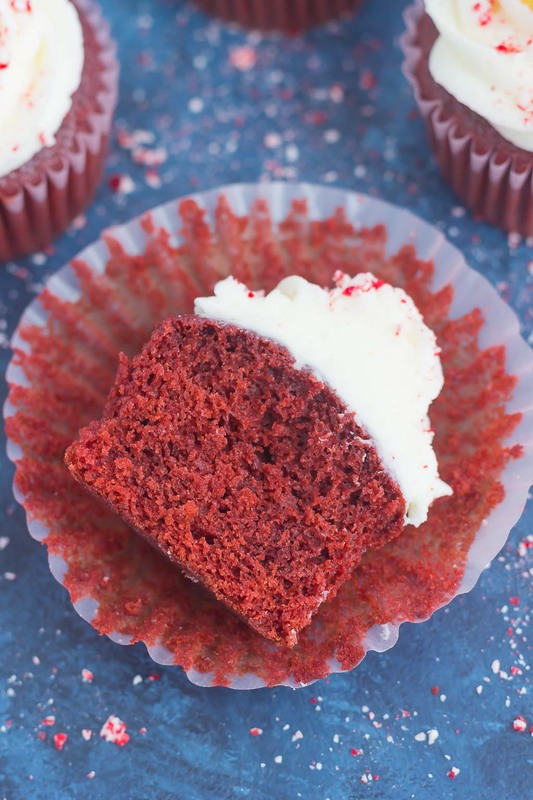 And these Peppermint Red Velvet Cupcakes are everything that I expect a cupcake to be…soft, moist, and bursting with flavor. 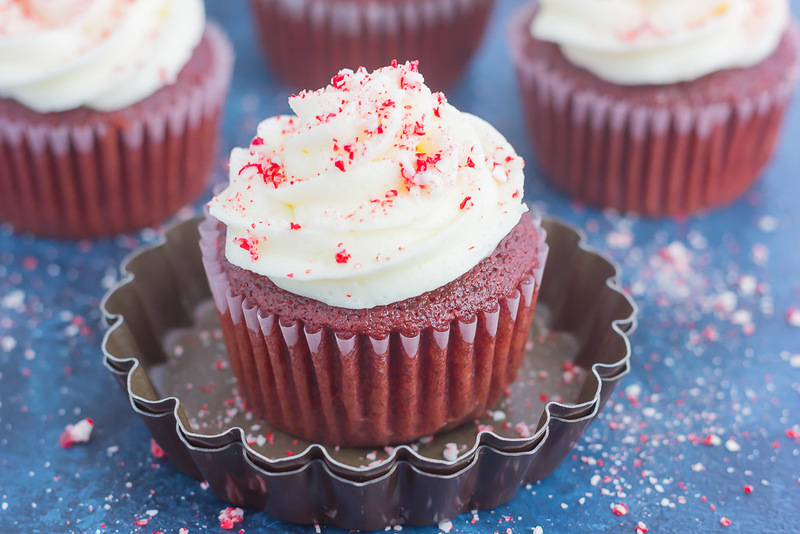 And if you’re a red velvet and peppermint lover, these cuties were made for you! 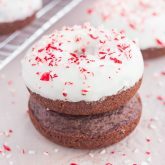 Not only is the frosting filled with peppermint, but the cupcake batter is, too. But only slightly, so it’s not too overpowering and it also lets that chocolatey goodness shine. 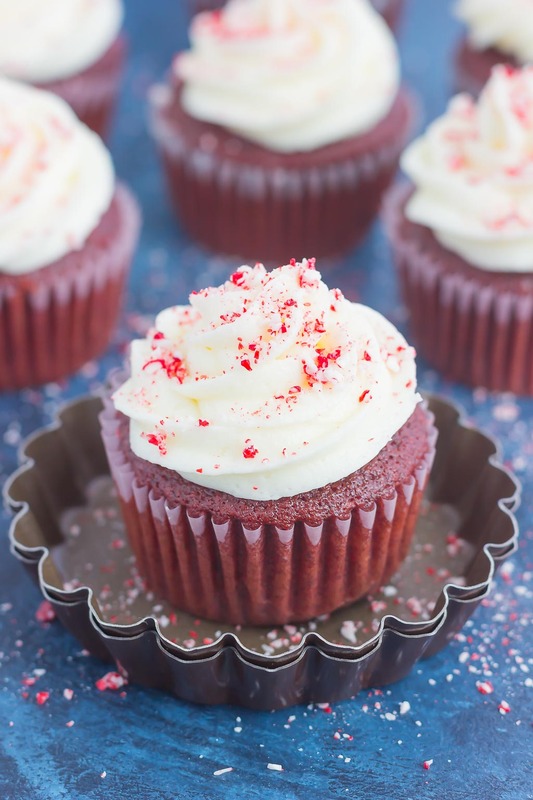 Like most of my recipes, these Peppermint Red Velvet Cupcakes are a breeze to make. Just two bowls and no mixer required (except for the frosting) and you’re on your way to the most delicious holiday treat. 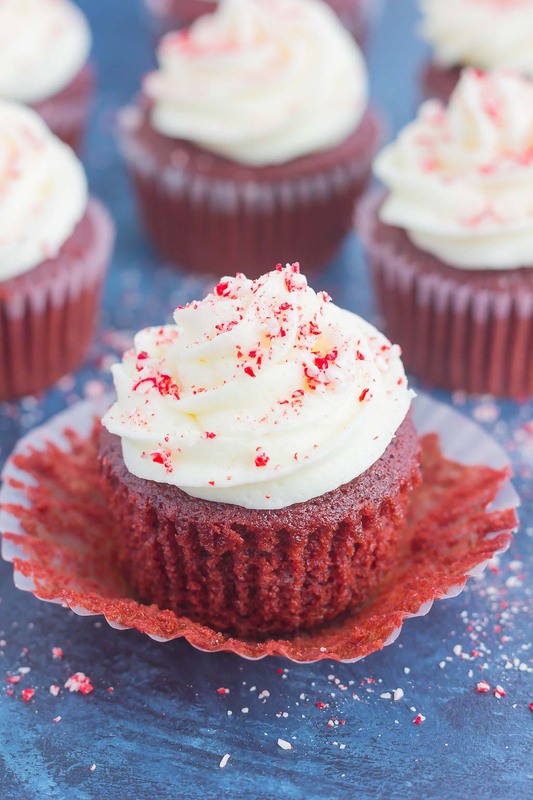 These cupcakes are fluffy, bursting with flavor, and topped with an irresistibly sweet frosting. What more could you ask for? Serve these beauties at your next holiday get-together and I guarantee everyone will love these! Preheat oven to 350F. Line a 12-count muffin pan with paper liners or grease well with non-stick cooking spray. Set aside. In a medium bowl, combine flour, unsweetened cocoa power, baking soda, and salt. Set aside. In a large bowl, whisk vegetable oil, milk, and egg. Add in sugar, vinegar, red food coloring, vanilla bean paste (or extract), and peppermint extract. Whisk to combine. Whisk flour mixture into wet ingredients until just combined. Spoon batter into prepared muffin tin, filling almost 3/4 full. Bake for 20-24 minutes, or until toothpick inserted into center of cupcake is clean. Remove from oven and let cool completely before frosting. To prepare frosting, cream softened butter in a large bowl until light and fluffy, for about 3 minutes. Add powdered sugar, 1/2 cup at a time, mixing to incorporate. Add milk and peppermint extract, beating to combine. Pipe or spread over cooled cupcakes. 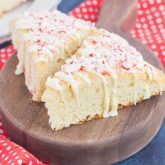 Then top with crushed candy canes. Alternatively, you could stir candy into frosting and then pipe, if desired. Beautiful! I was just trying to think of a creative Cupcakes for kids. Will try this weekend. Thanks! Hope you and your kids love these, Sara! Thanks for stopping by! I Made them Cupcakes Gayle and they love it!! Thanks for Recipe I appreciate it. I'm so glad you all enjoyed these, Sarah! Thanks so much for letting me know!